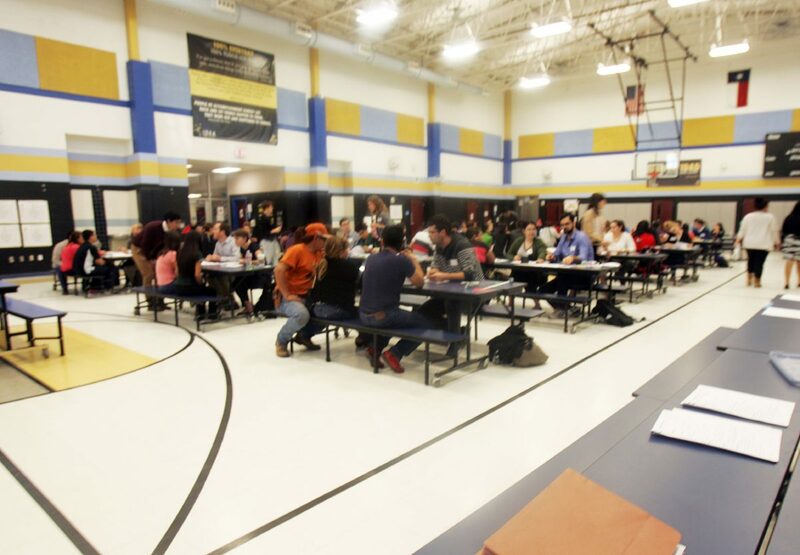 Volunteers help students renew their application for renewal in the DACA (Deferred Action for Childhood Arrivals) program at IDEA Academy Jan. 13, 2016 in San Juan. McALLEN — The first thing she did was get a driver’s permit and eventually a part-time job. Having just been approved for the federal program that protected her from deportation, the Deferred Action for Childhood Arrivals, the aim for this recipient, who we’ll call Kimberly, was to become a productive member of society. What she didn’t know was that despite acclimating herself to the only country she’s ever known, her very legal status would eventually be in question, and eventually politicized. The Guerrero state native, who spoke on a condition of anonymity for fear of retribution, recently spoke fondly of her life in America. 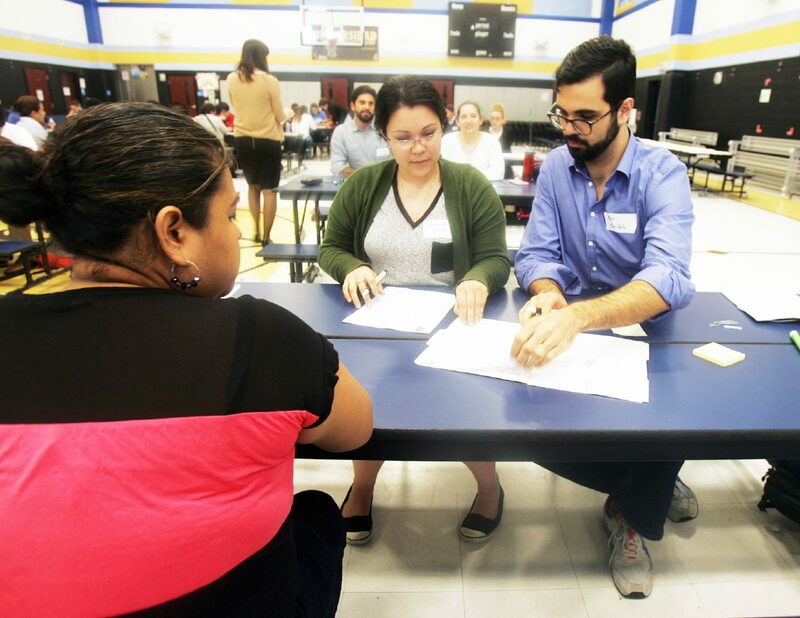 Volunteers help students, Jasmine Grant, left, and Alex Zendeh, assist in an application for renewal in the DACA (Deferred Action for Childhood Arrivals) program at IDEA Academy Jan. 13, 2016 in San Juan. A few years after gaining DACA approval, she had saved up enough money to buy her own car at age 16. It was something of an accomplishment for her, especially considering she was the first in her group of friends of mostly U.S. citizens to buy one. Kimberly, who was brought to Texas by her parents at age 4, said she felt like any other American teenager who worked hard to save up for a car. Things changed on Monday, Sept. 11, just an hour after boarding a commercial bus headed more than 300 miles north of the Rio Grande Valley, where she works at a roofing company. That’s where the 20-year-old DACA recipient was detained. Almost immediately, the sense of security she had experienced over the last four years as a recipient of the program vanished. Upon arriving at the Falfurrias checkpoint around 7 a.m., Kimberly recalls a U.S. Border Patrol agent boarded the bus and asked her to follow him. She was the first of a total of nine DACA recipients to be detained that day. In all, Kimberly said six men and three women were detained Monday. They were originally headed north to places like Corpus Christi and Robstown. The group, who were all DACA recipients, was held for several hours with the last of the detainees not being released until just before 7 p.m. — nearly 12 hours later. This came less than a week after U.S. Attorney General Jeff Sessions announced that the program instituted under the Obama administration more than five years ago was being phased out. The caveat was that Congress would have to create a plan to replace it for the nearly 1 million people enrolled. As the only one in the group not originally from the Valley, Kimberly said her shock turned to panic when agents told the group that they were going to be processed and then deported. Shortly after word spread of the detainment, border patrol as well as U.S. Customs and Border Protection authorities released a brief statement regarding the detention. Kimberly’s detainment and that of the others, sparked outrage from politicians who questioned CBP’s actions, asking for clarity on what seemingly was a new policy regarding DACA recipients with regard to their travel within the United States. U.S. Reps. Vicente Gonzalez, D-McAllen, Henry Cuellar, D-Laredo, and Filemon Vela, D-Brownsville, also reacted strongly. “After speaking with (Rio Grande Valley Sector Chief Manuel Padilla), I can report the following: It is clear that the DACA recipients in question were held for too long,” Gonzalez said in a prepared statement Monday. Vela also raised concern about the length of time the DACA recipients were held. Only two days after the group’s detainment, Democratic leaders who met with the president Wednesday night announced an agreement on a replacement for the program. But Trump, who on Thursday confirmed the discussions with Democratic and Republican leaders on DACA, stated that no deal had been put in place. Despite as much, the president said he would work quickly to come to an agreement, but that border security enforcement must be included. Many DACA recipients and advocates of the country’s immigrant youth believe the status of dreamers in the country should not be used as a bargaining chip. Osiris Badillo, 20, of Edinburg, who lived nearly her entire life in what Guillen calls a militarized area, fears the incident last Monday means that she and other DACA recipients like her will end up going “back into the shadows” — this as a means to survive and avoid deportation. Badillo, who is employed at a hotel and currently enrolled at the University of Texas Rio Grande Valley, is scheduled to graduate in early 2018 with a degree in mass communications, but is concerned she won’t be able to finish her semester before the March 2018 expiration date. Kimberly shares Badillo’s optimism and believes national support for dreamers could lead to a deal from Congress.